Hello friends! 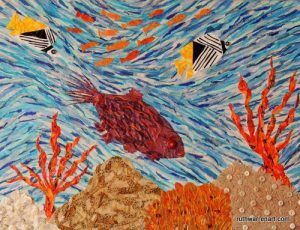 I’m excited to share the news of a new group exhibit that includes one of my pieces, Coral Reef Currents. “Something to Talk About” is a juried, all media exhibit that runs at ArtCenter Manatee through September 30. An artist reception is scheduled for September 8 from 5-7pm. This is my first inclusion in an exhibit at ArtCenter Manatee, and I look forward to learning more about this awesome gallery! Find out more about the exhibit here. For more information about the creation of Coral Reef Currents, check out this blog entry I wrote shortly after completing it.